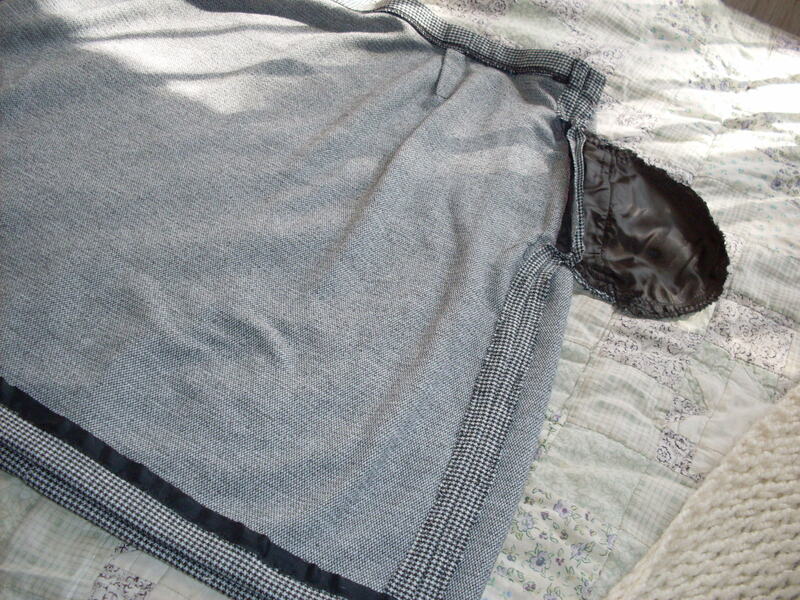 I bought this polyester and rayon blend knit skirt with a small black and white houndstooth pattern for $5 at Goodwill. It was large and long with a long slit up the back so I had plenty of material to work with. I wasn’t sure how to start: should I cut to make a new hem or a new waistband? 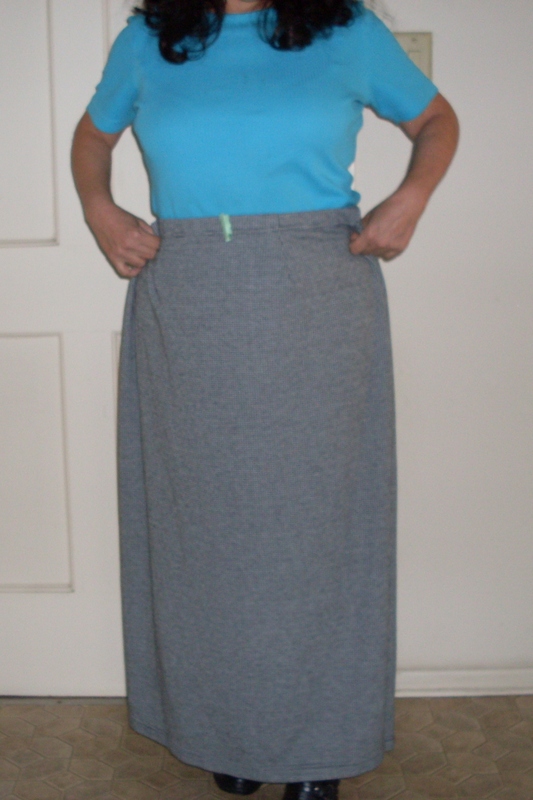 I decided to keep it simple so I kept the existing elastic waistband and cut up from the bottom to make a new hemline. 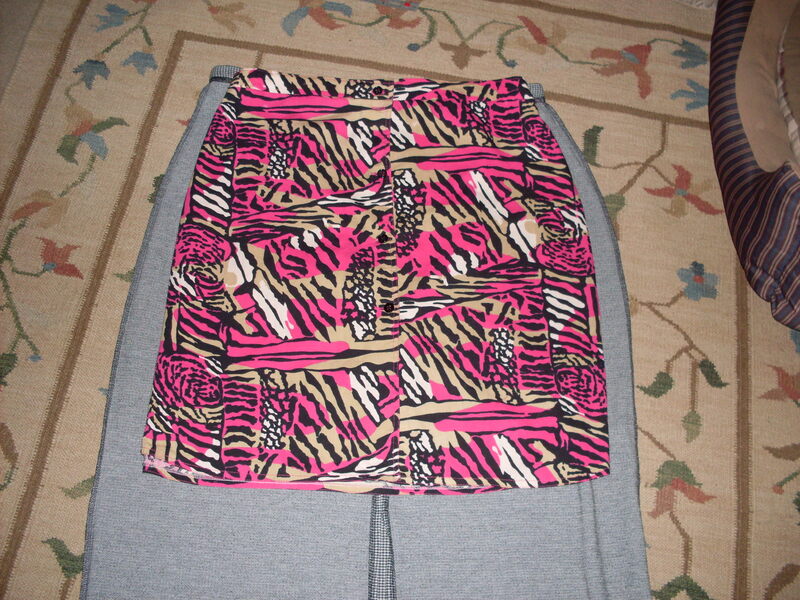 I put it against my “wild” skirt to mark new seams. Then I put it on and decided I wanted to add pockets. I looked in a few books and online for some help in doing this. 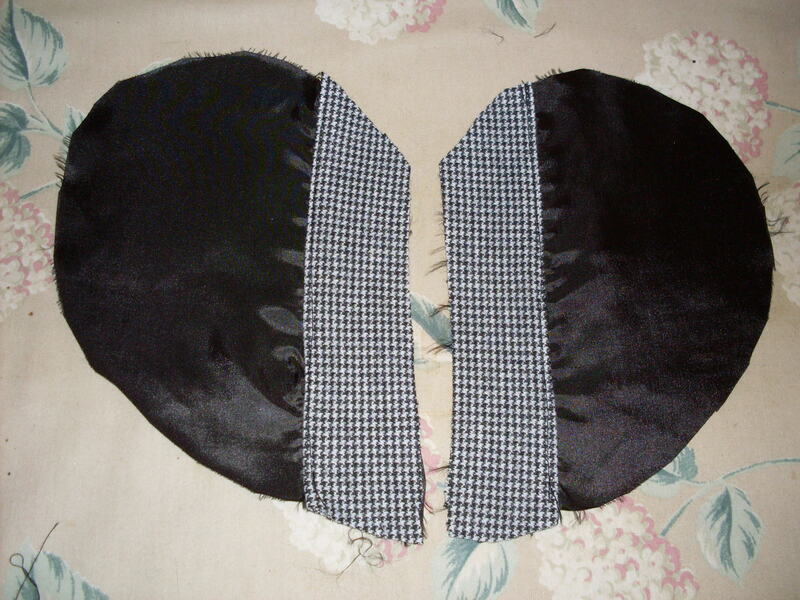 I cut the pockets out of lining polyester I already had and included the skirt material as facings. I had some trouble making my pockets lie flat. They add some bulk to the hips- not a good thing! 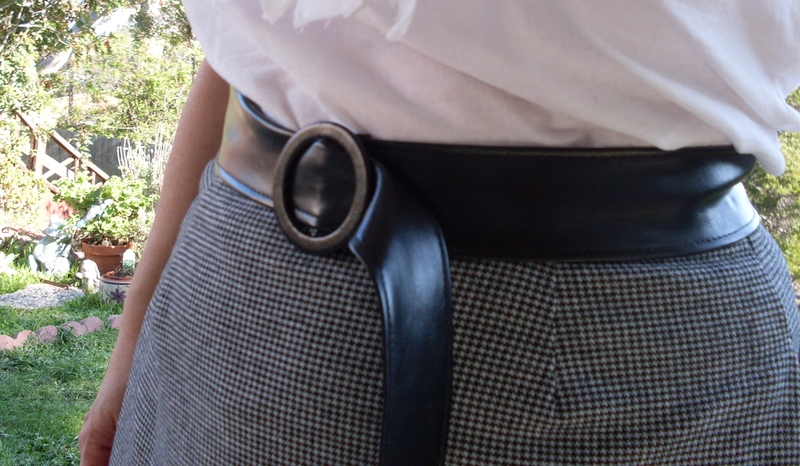 I sewed rayon seam binding on the hem and then finished it by hand stitching. I think I could have saved some time and just machine stitched the hem because my hem is not invisible due to puckering. My verdict: I don’t think the shape or style is very flattering on me. I feel dowdy and stuffy in it. Maybe making it shorter would have helped. Not really my cup of tea. Also I don’t like that the color looks so gray and blah from a distance. Nothing I tried on looked good with it. I just can’t envision myself wearing this. I always wear pants in the winter because I don’t like to wear pantyhose and I don’t want to have bare legs on a winter morning, and this skirt won’t be the one to break me of that habit. 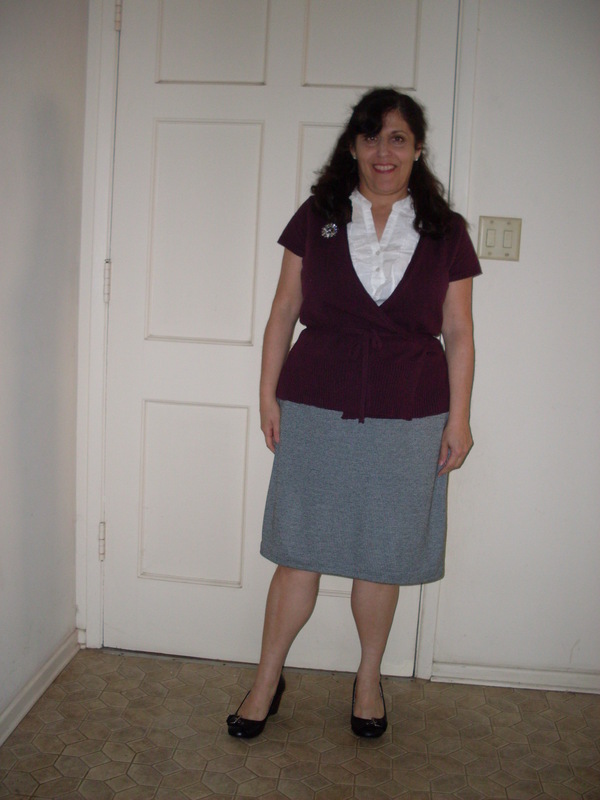 This entry was posted in Refashions and tagged refashion, thrifing on February 15, 2013 by Stitch It Again.